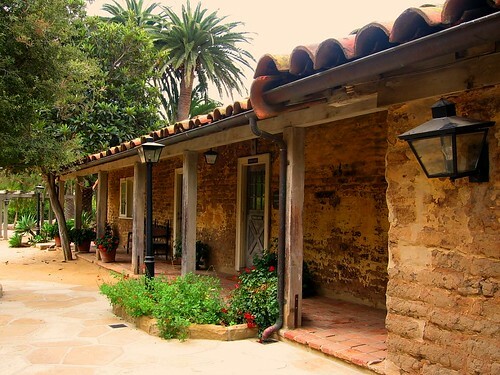 The families who lived in Santa Barbara's Covarrubias Adobe were the royalty of "Old California", and their stories, and those of the city, and of California itself, still swirl within her walls. Located at 715 Santa Barbara Street, the building is designated as a City, State, and National Registered Historic Landmark. 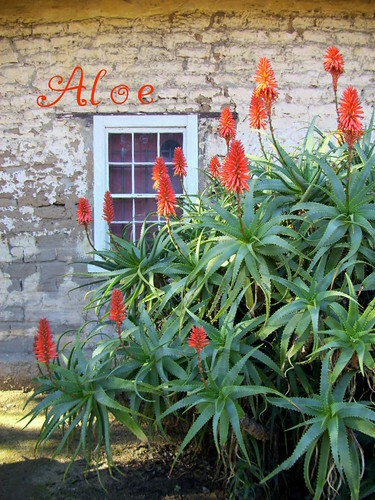 The architecture of the building and the style of the gardens that surround the home are representative of the "Colonial California" era . 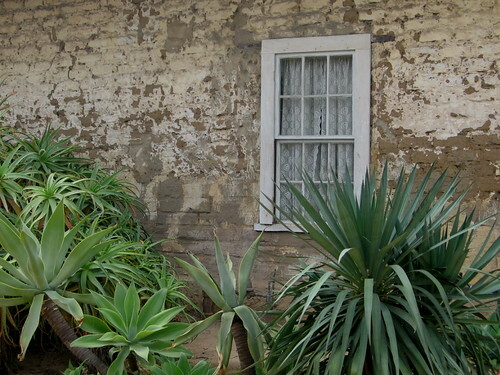 Built in 1817, the Covarrubias Adobe is one of the oldest buildings in Santa Barbara. Don Dominguez Carrillo, original owner of the adobe, was, according to his brother-in-law, Pio Pico, "...one of the most influential and capable men in California." He was one of early Santa Barbara's elder statesmen, a wealthy land owner, and a community icon. The home was built with generous rooms that had an airy, open feeling, including the 55' gran sala, or parlor, which was a perfect venue for many celebrations, family events, and community gatherings. 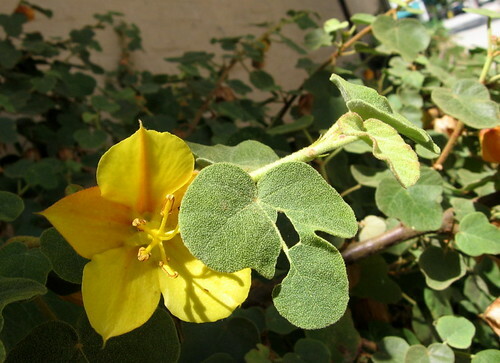 The beautiful landscaping and colorful gardens were legendary in the sparse and arid surroundings. Senora Carrillo's brother, Pio Pico, was the governor of California during the very tumultuous last-days of Mexican rule. He was known to visit Santa Barbara often, and there were certain to have been many dramatic and historic conversations here. It is said that this was the last meeting place of the Mexican Congress before California came under the rule of the United States. Don Dominguez Carillo's daughter married Don Jose Maria Covarrubias, and they took possession of the home in 1847. The Covarrubias family lived in the home for more than 50 years. In addition to his family duties, Don Jose became the first federal elector from American California. In the WPA book entitled, Santa Barbara, published in 1941, the author relates a story about Don Jose's trip to Washington to deliver that first electoral vote for Franklin Pierce, our 14th president. When he "arrived at the New York port, all of Tammany Hall was there to welcome him, and he spent $10,000 for wine and dinner parties on the visit." Since their earliest days in California, the Carrillo and Covarrubias families lived an almost theatrical existence. They were known and feted wherever they went. You may see authentic clothing, jewelry, artwork and other historic items from these and other local families of the era at the Santa Barbara Historical Museum, located adjacent to the adobe. At the start of the 20th century, the Covarrubias family had moved on, and the building was abandoned and neglected. 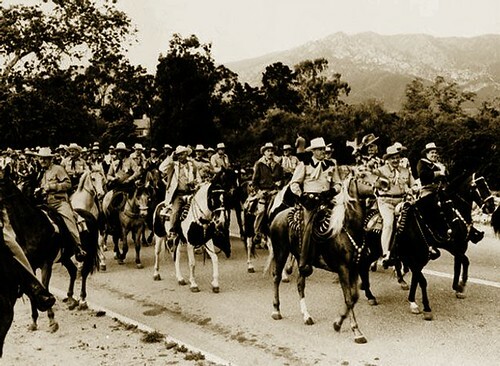 However, in 1924, it was rebuilt by members of a group known as "Los Adobes de Los Rancheros". 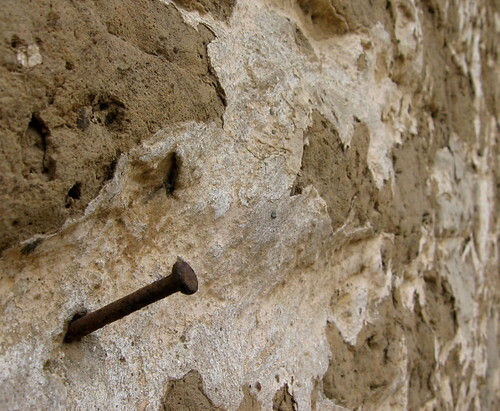 The group was dedicated to restoring and preserving these priceless remnants of early California. 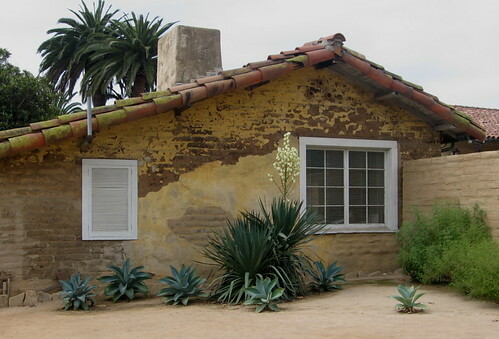 Then, in 1941, a new group of "royals" took possession of this adobe structure. They were the "Los Rancheros Vistadores" . The group was started by Western artist, Edward Borein, who so eloquently captured the "Old West" in his drawings, paintings, and etchings. Having witnessed the last days of the "wild west" first hand, Borein longed to experience that earlier time again, and to introduce others to the beauties and thrills of life on the range. He organized a group of men who gathered each May to herd cattle through the back country, to rope and ride and sleep under the stars. Today, Los Rancheros Vistadores continues the tradition, with about 1,000 riders participating each year. They ride on horses, in stagecoaches, and on old buckboards. They are accompanied by country western singers, cowboy poets, and a host of other entertainers, and, a well-stocked chuck wagon. Their encampments are rustic but luxurious. The list of members reads like a Who's Who of the world. Ronald Reagan was a member, and today, an international group of ranchers, captains of industry, politicians, actors, magnates and potentates continue to ride into the sunset each May. The old structure has finally been handed down to the people who live in and visit the City of Santa Barbara, and it remains a touchstone of our historic beginnings as a California city. Nice that you are sharing information with the public on this landmark on the www. I may possibly be a relative, (very distant) as I am descended from the Carrillos and a Covarrubias family, who was from Spain but had lived in Chile, South America. Did the Covarrubias family emigrate from South America to California? Do you know? You can contact the Santa Barbara Historical Museum at 805-966-1601. Hello, I am a member of the Covarrubias Family. How do I get to the Adobe because I want to be able to show my daughter our heritage. I also want to take my parents, Joseph and Beatrice Covarrubias- where my dad has relatives' buried in one of the family crypts and the Santa Barbara Mission. Thank you so much!